Yikes! And those are just my orders, it doesn’t include the things I want to make for my own family for the Holidays! So while my machine is at the repairman getting 2 gears replaced (I should get it back sometime next week! ), I’m spending some much-needed quality time with my girls. I’m also working on my doll patterns! 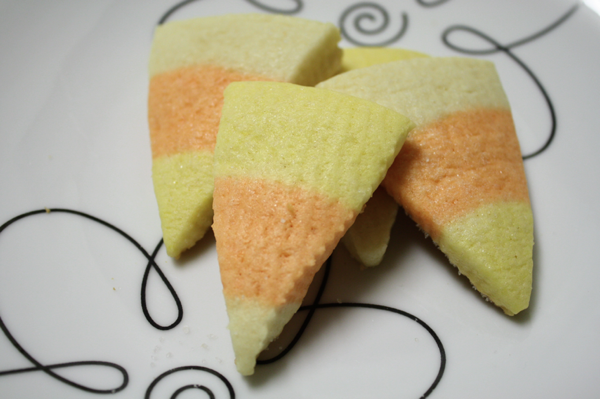 Yesterday we made some candy corn sugar cookies. 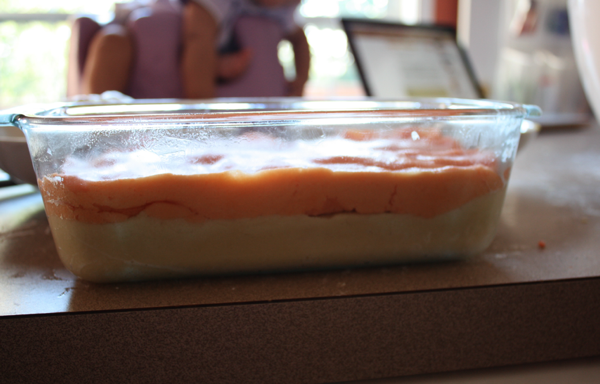 I scoured the internet looking for recipes, and really didn’t find anything that I liked. 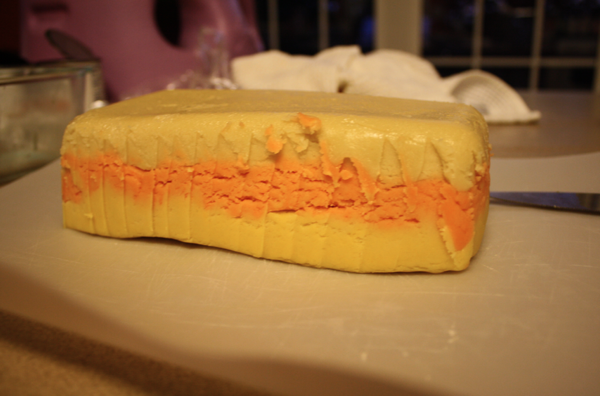 Most of the recipes have a chocolate layer, which just looks like a burned candy corn to me. Not exactly appealing! So, I took my favorite sugar cookie recipe and flew by the seat of my pants from there! Cream butter and sugar until smooth. Beat in eggs and vanilla. 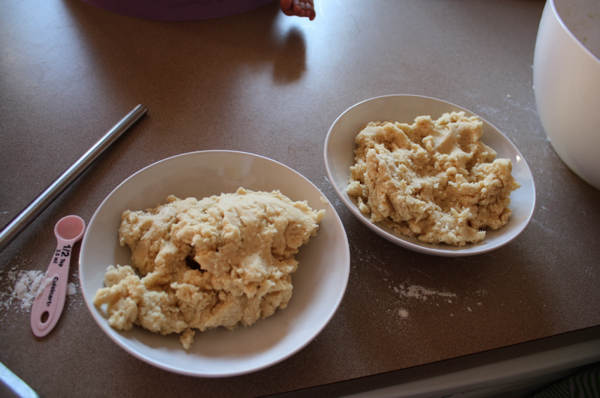 In a separate bowl, mix together flour, baking powder, and salt. Stir dry mixture into wet ingredients until incorporated. Here’s where I started experimenting. 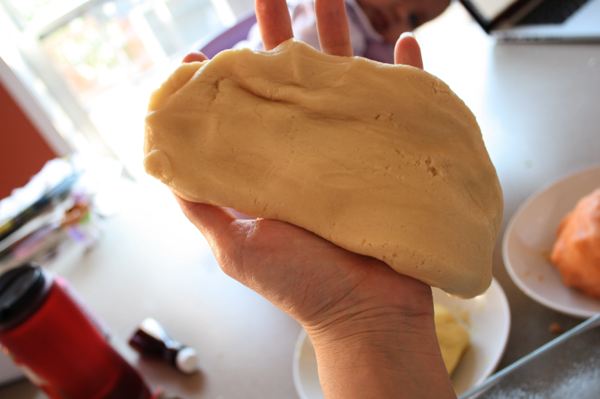 Divide the dough into thirds. 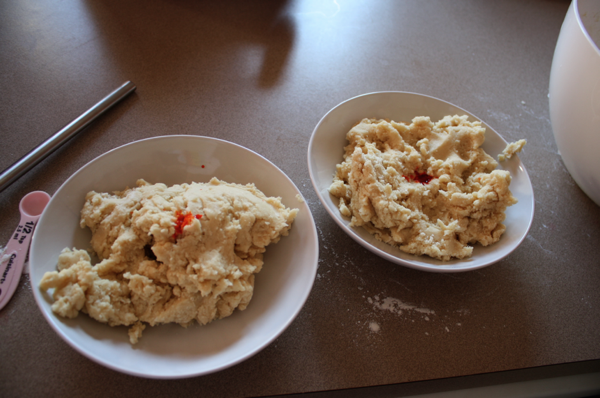 To 2 of the 3 pieces of dough, add food coloring. I did 8 drops of yellow on the yellow ball, and 8 drops of yellow with 4 drops of red on the orange ball. The third ball was left untouched. 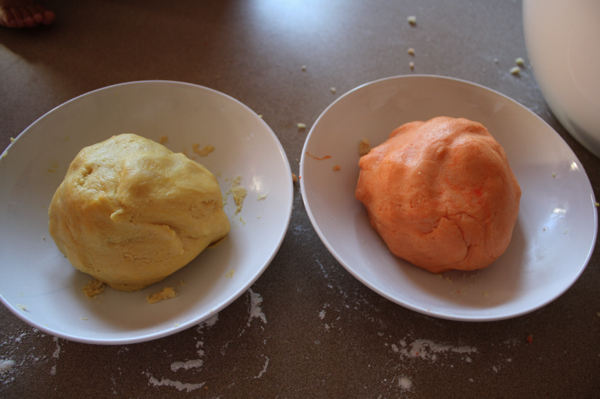 I kneaded each ball about 5 minutes to get the color fully mixed. 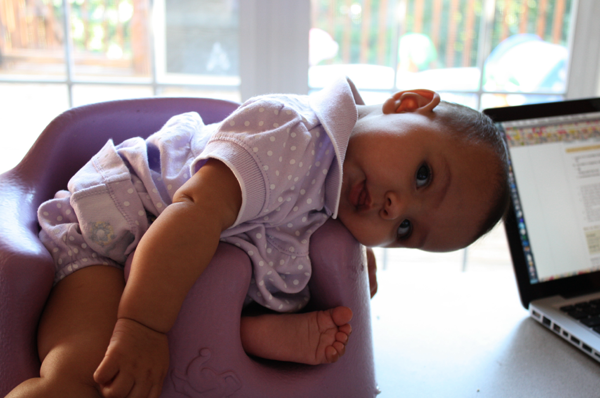 Your help may be starting to get bored by now! 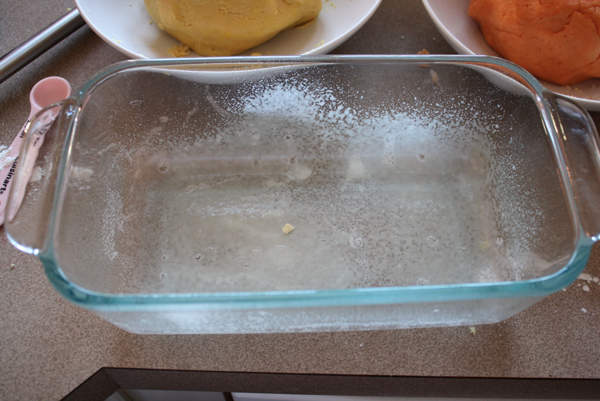 Grease an 8×4 loaf pan. In the future, I’ll probably also line the pan with saran wrap to get the dough out easier. 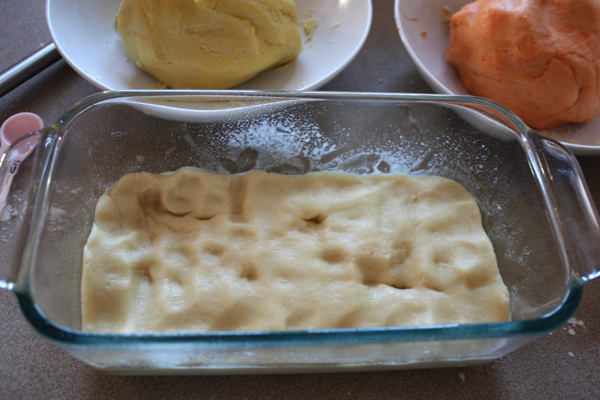 Take your plain dough and flatten to an approximate rectangle shape. 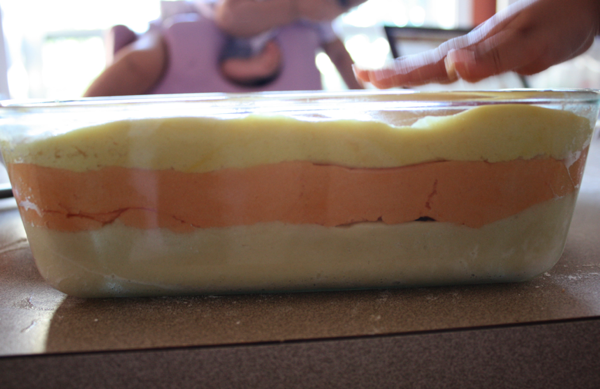 Place in the bottom of the loaf pan and press to fill the pan. Try to make it even on top. 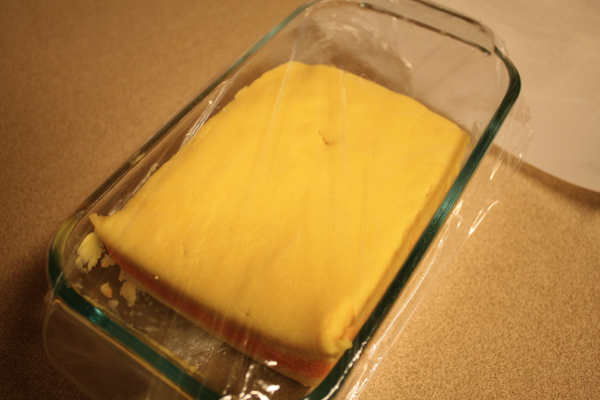 Cover the loaf pan and place in the fridge for at least an hour. I recommend overnight. 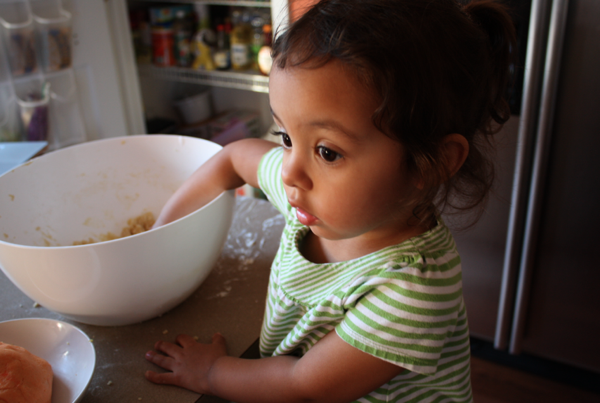 When you take it out to make your cookies, turn the pan over to remove the dough. You can see I had trouble getting mine out and had to separate it from the pan with a knife. This is why I’m going to use plastic wrap next time! Slice off pieces about 1/4″ thick and lay flat. 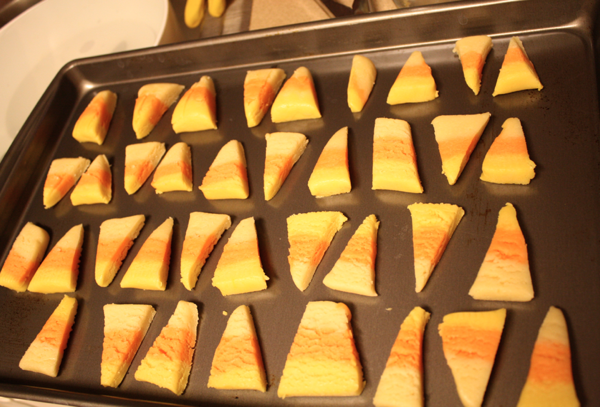 Cut into candy corn shape pieces. 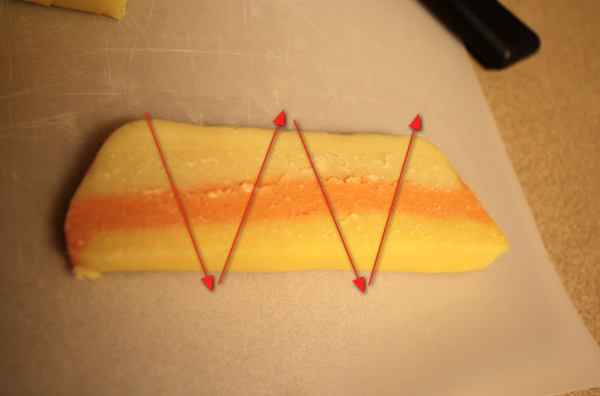 I marked how I cut mine, using the shape of the loaf pan to my advantage! Place on a cookie sheet about 1″ apart (mine were a little closer) and bake at 350 degrees for 8-10 minutes. I take my cookies out just before the edges brown so they stay nice and soft in the middle. 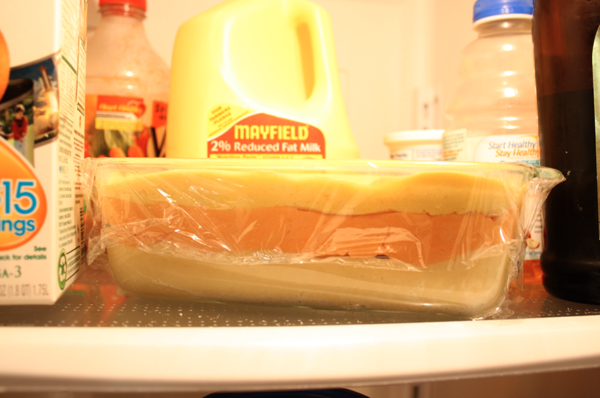 I put my unused dough back in the loaf pan, recovered it, and put it back in the fridge between bakings. I would estimate this recipe makes about 10 dozen cookies. That sounds like a lot, and it is, but they’re bite size, so they’re quicker and easier to eat! Plus, you’ll end up giving them away because they’re just so cute and festive! Ooh, the kids and I are so making these tomorrow! 🙂 Cute! Made these this weekend!! Wonderful idea and recipe.